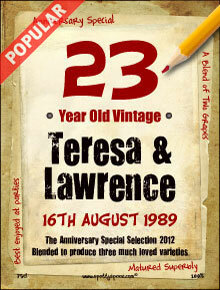 Personalise this delightful wine label to create a brilliant gift for a couple celebrating their anniversary. 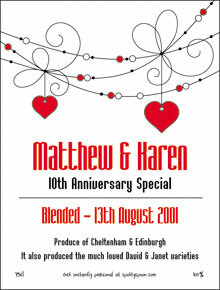 Whether 10th, 20th, 25th, 40th etc., this is perfect for single gifts or big bash parties. 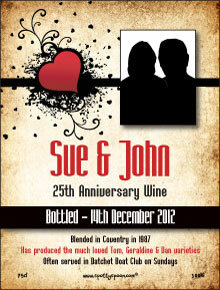 Holding an anniversary party for friends and family, why not have the wine personalized for the big occasion. 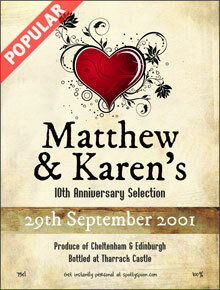 Note - good words for celebrating anniversaries are 'matured for 25 years', 'much loved', 'a perfect marriage of grapes', 'has produced the younger Mary & John varieties etc. Easy to use, exceptionally quick delivery.